Is there anything better than snuggling up in a blanket that falls just right? My sisters and I have a bunch of fuzzy fleece blankets that are just perfect for that, and all of them were given to us by one aunt. This aunt has always been just a big part of my life and she’s always there to give you whatever you need, and I wanted to do something for her. 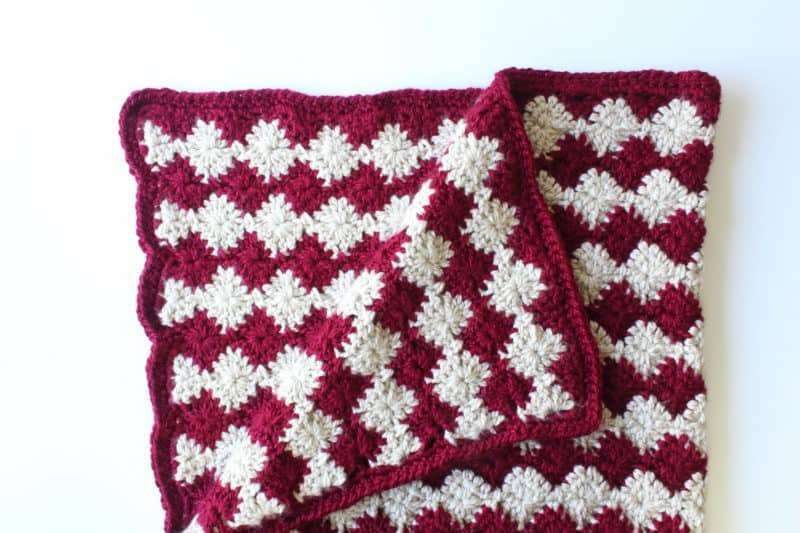 I came up with this free crochet blanket pattern as a gift for her and to show her that we appreciate her. Because isn’t that best part about handmade gifts? 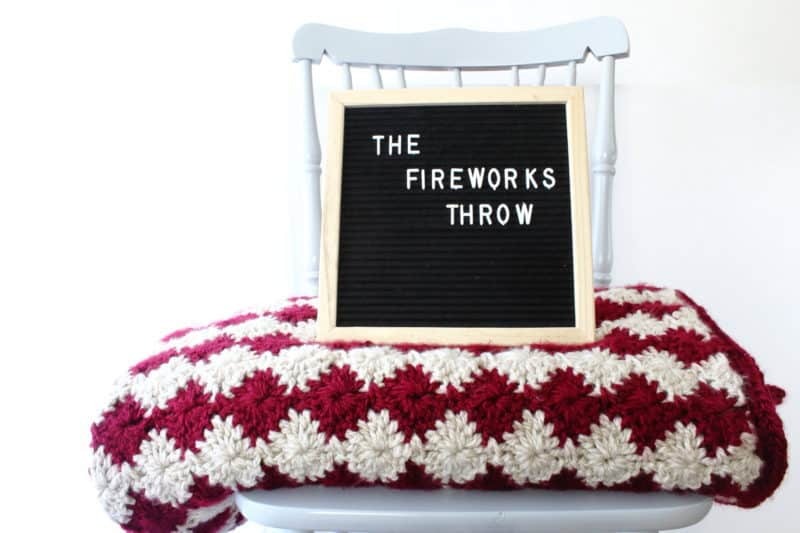 Here is the Fireworks Throw crochet blanket pattern! My aunt is a stickler for keeping things just right. Going into this blanket, I knew the yarn choice had to be something she can throw in the wash as often as she wanted without worry about damage. It also had to be thick and warm and super soft! For me, that means Sprightly Acrylic yarn. It’s a really high-quality acrylic that feels nice against the skin and comes in a ton of colors. I made my blanket pretty big at 60 x 72 inches. 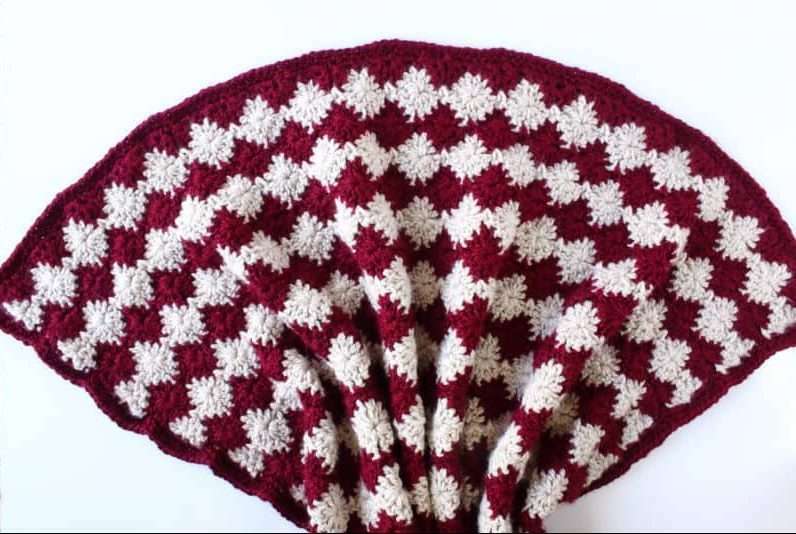 You can easily make yours smaller if you want by starting with fewer repeats and working fewer rows. I have a handy cheat sheet with measurements for all different blanket sizes available for free down below. 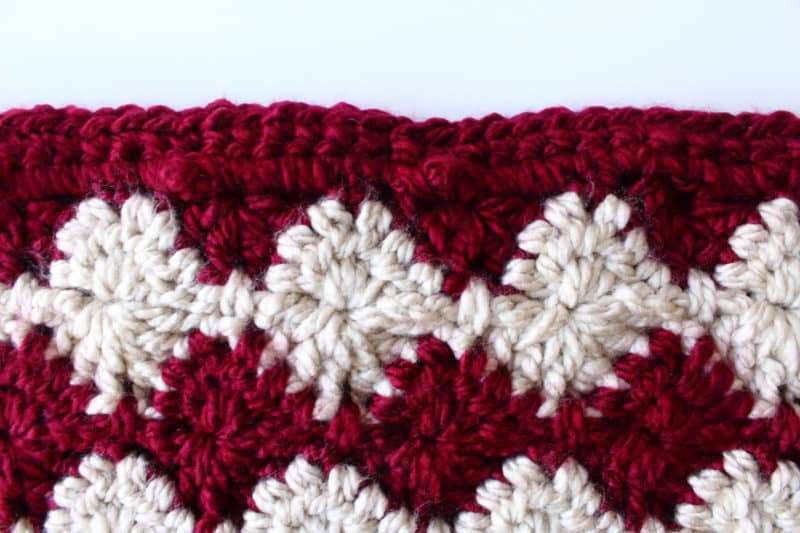 Speaking of the stitch, this is the Harlequin stitch. It does sound a little complicated when you first start, but it’s a quick pattern to pick up and memorize. 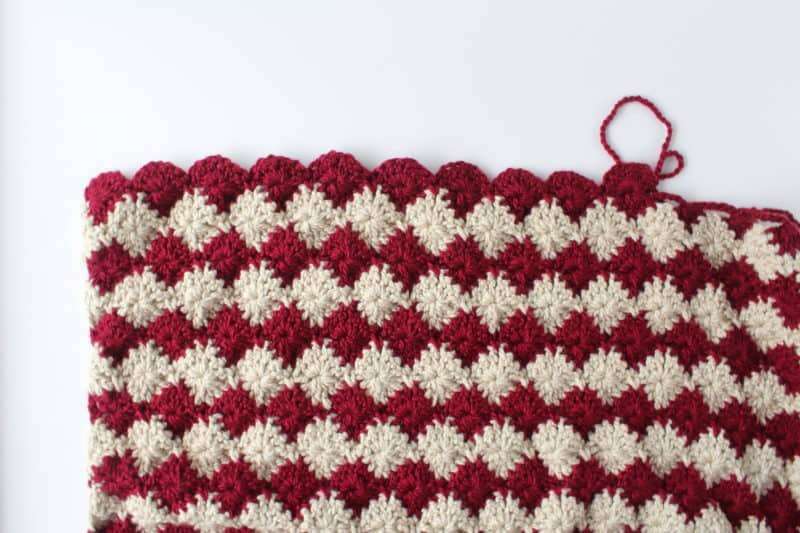 I’ve written the pattern out for you below, but if you need some step by step pictures, be sure to check out daisy.farm.stitches; she has a ton of stitch tutorials! Row 1: With color A, chain 137 ( or another multiple of 8 +1). Row 2: Insert your hook into the 5th space from the hook and [DC 3, ch 1, DC 3] into the space. Skip 3 spaces, SC into the next. *Skip 3 spaces, [DC 3, ch 1, DC 3] in next, skip 3, SC into the next*. Repeat everything in the *s until the end of the row. Switch to Color B. Carry your yarn up the sides so you don’t have to weave in as many ends! Row 3: Ch 3, turn. Skip the first SC and DC3tog over the next 3 spaces. *Ch 7, skip the ch 1, DC6tog over the next 6 DC (skipping the SC). Repeat from * until the last 3 spaces, DC3tog, and DC 1 into the top of the last chain. Row 4: Ch 3, turn. Work 3 DC into the hole between the DC3tog and the DC from the row below. *SC around the chain 1 from below (trapping the chain 7), [DC 3, chain 1, DC 3] in the center of the DC6tog. Repeat from * until the last DC3tog. Work 3 DC into the space, DC 1 into the top of the chain. Row 5: Chain 3, turn. Skip the first DC, *DC6tog over the next 6 DC, chain 7, skip the chain 1, repeat from * until the end. Chain 3, SC into the top of the turning chain. Row 6: Chain 1, turn. Skip the first SC and the chain 3. *[DC 3, chain 1, DC 3] into the center of the DC6tog, SC into chain 1 space (trapping chain 7), repeat until the end of the row. SC into the top of the turning chain. 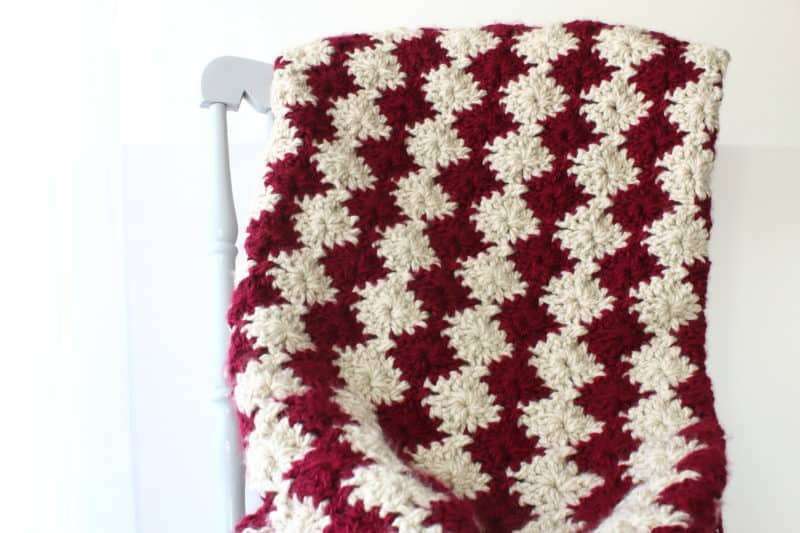 Repeat rows 3-6 until the blanket reaches the height you want it to be. I continued until I had used up all but half of the skein of Burgandy and my blanket was 71 inches long. 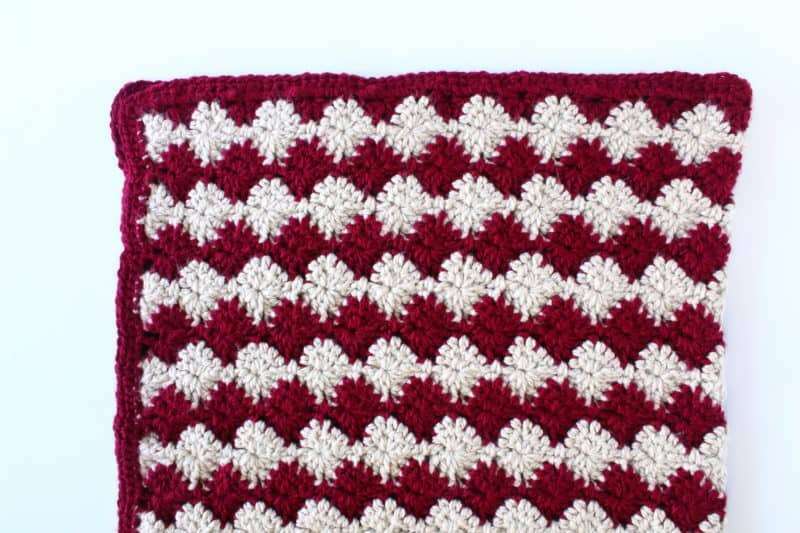 For this free crochet blanket pattern, I planned on doing a wide border using a moss stitch or something else flat. But once I finished, it didn’t seem like it needed it anymore. I settled on working 2 rounds of SC around the entire blanket, working into the sides of the stitches and working 3 SC into each corner. It made a nice, clean edge and it hid the color changes on the sides. If you used a different method than the magic knot to change colors, this border would also hide the ends and weave some tails in for you. I love how my Fireworks Throw turned out and it reminds me of how excited my aunt and uncle always are when they see us. They always treat a visit with us as a big event and are totally in the moment. I think that’s something really special and I hope my aunt sees that we love her when she sees her blanket. 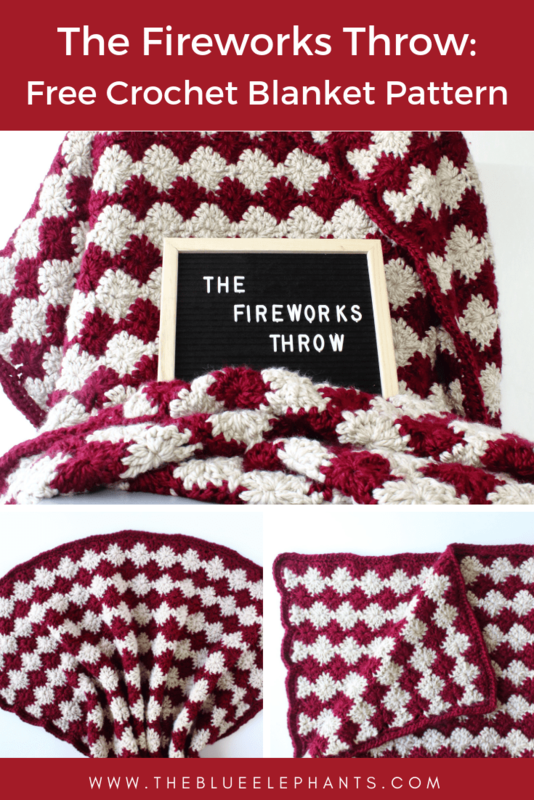 I’m writing up this free crochet blanket pattern early but I have to hold on to the pattern and pictures until I can actually surprise her with the blanket! 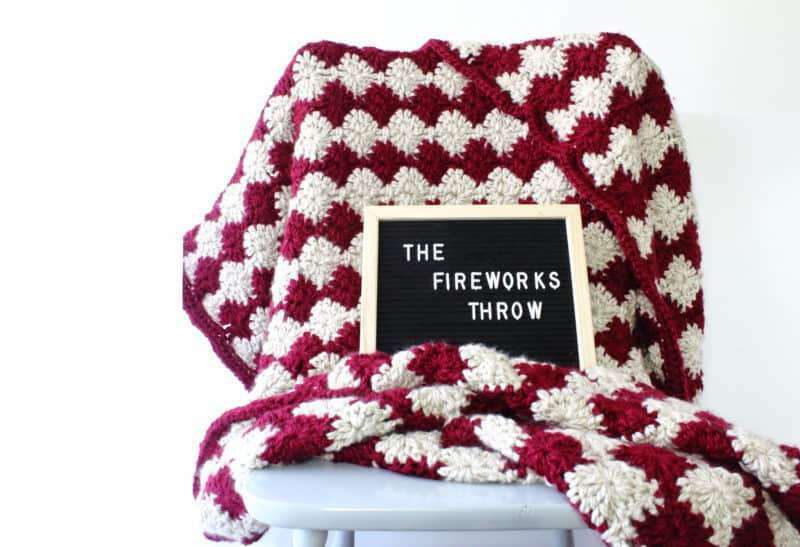 If you liked this, you might also like the Mulberry Throw, another free crochet blanket pattern, and subscribe to the newsletter. 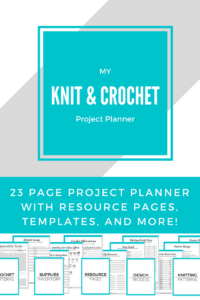 When you sign up using the box below, you’ll get access to the resource library with freebies like the Blanket Sizing Guide and new patterns, tips, and post in your inbox every week. 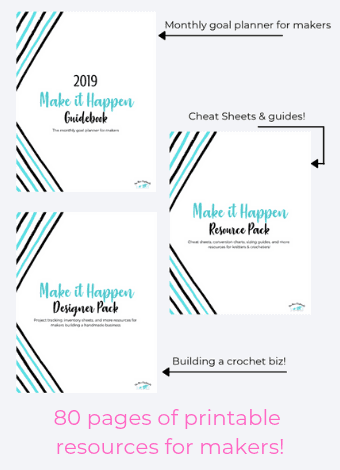 It’s completely free and it helps me run this blog and give you more free patterns. And I have some great ones coming up! Thanks so much for your help. You definitely put my mind at ease! I was beginning to think that I finally cracked up! My navy blue and light blue are working up beautifully!. Every row I stop and admire how pretty it is! I don’t think I’ll ever be able to k you enough for sharing! OK, so I am using a J, 5.75mm hook and Red Heart Super Saver (4 wt) yarn.. I started with a chain over 60 inches because I wanted a big afghan. After working several rows my work is only measuring about 43 inches. Is this normal with thin pattern? 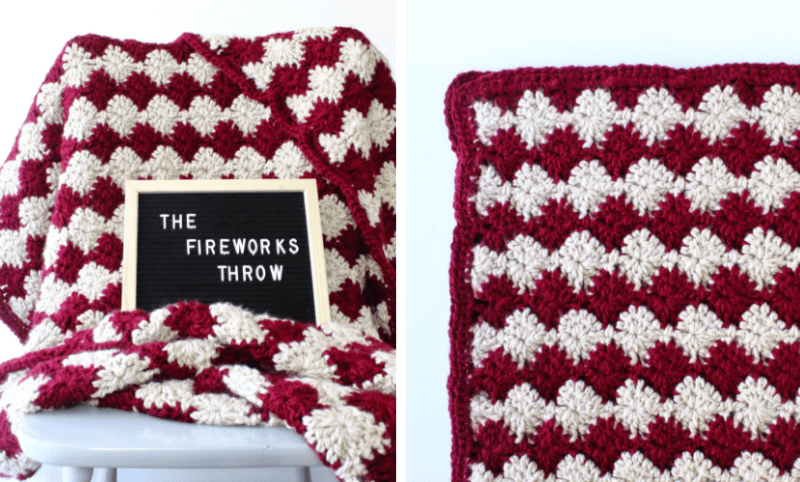 I’m still working on this throw and it is turning out beautifully….just too small. Again, thanks for the pattern. It’s turning out small because you’re using a smaller hook and yarn. Your gauge is different, so you’ll need to adjust. 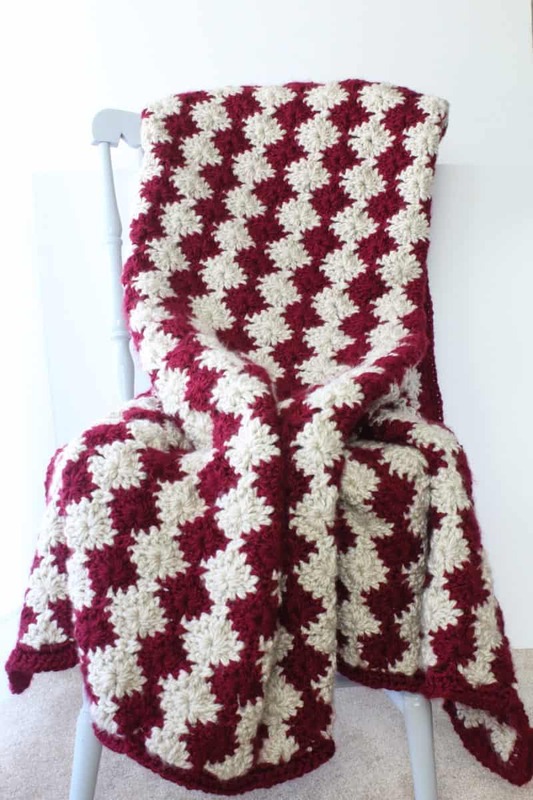 The first row is smaller than the chain because of the way the pattern is worked so try adding 1/3 more chains to the get the blanket up to 60 inches. 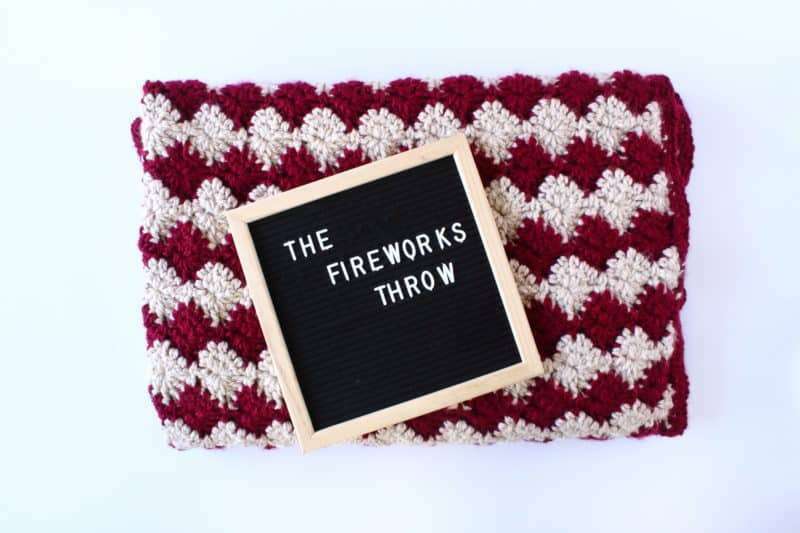 I love your Fireworks Throw but being a beginner crocheter I was wondering if this would work with 4 wt worsted yarn. How many chains would I need to make a throw the same size as yours? Thank you! With a #4 yarn, you’ll also need to go down a couple sizes with your hook, so your gauge will be different than mine and you’ll need considerably more chains and yarn to get the same size blanket. You could start by making a chain that’s 60 inches long (however many chains that adds up to) and then adjust to get a multiple of 8+1 by adding or removing a few chains.